Few psychiatric diagnoses have the ability to stir up so much controversy as bipolar disorder. What we think of today as bipolar disorder has been around as long as humanity. So in some ways the presentation is easy to spot. On the other hand, overlap with other diagnoses, varied presentation, and debates over diagnostic criteria and treatments complicate the picture. Ashish Anand, MD, is board certified in Child, Adolescent, and Adult Psychiatry. He completed his Child Psychiatry fellowship at New York Presbyterian Hospital (in the combined Columbia and Cornell program) where he served as the Chief Fellow at Columbia. Both his medical school and residency training were in Boston (Boston Medical Center/ BU School of Medicine). Dr. Anand is currently in private Practice in Ridgewood, NJ. He also is an attending psychiatrist at a partial care program caring for patients with serious mental illness, including bipolar disorder. * be able to describe and explain the diagnosis of bipolar disorder and its varied presentations. * explain the pathophysiology of bipolar disorder and describe the current treatments offered. Cresskill Senior Center, 38 Spring St.
Payment for CE is to be made online only, to NJPA, after the program. NJPA members $15; sustaining members N/C. NJPA non-members $25. After the program, you can remit payment to NJPA online using a link to be distributed at the program, after which you will receive a confirmation email with a link to the CE evaluation form. Refund available only if cancellation received by March 22nd. This program is co-sponsored by NJPA and NCAP. 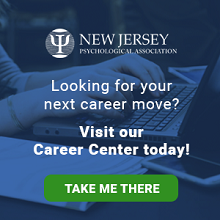 NJPA is approved by the American Psychological Association to sponsor continuing edu- cation for psychologists. NJPA maintains responsibility for the program and its content. This program qualifies for 2 C.E. credit hours for psychologists. Intended audience: Psychologists, social workers, mental health counselors, marriage and family therapists, and graduate students. Program sophistication: Introductory: no prior knowledge of the specific topic is required. The presenter has no commercial support or conflict of interest for this program. Location is ADA accessible. For further accommodations contact Joan Fiorello, [email protected] or 201-784-0312. Requests must be made at least 14 days prior to the event.